I am pleased to be able to introduce a special issue of Encounters. When we started Encounters it was with an aim to be able to hear new voices, voicing their reflections on mission and missiology. In particular we wanted to allow British and wider European voices to be heard commenting on and wrestling with global missiological issues as well as with our own Europe specific “stuff”. In doing so we hoped to hear new voices that were not being heard before. To some extent we have achieved that aim. But just as the last edition of Encounters highlighted that there are many more issues for us to be looking at, I believe there are many more voices to be heard. How do we encourage new voices to speak, to raise their heads above the parapet and say something? This issue is an attempt to give a platform to some new voices. 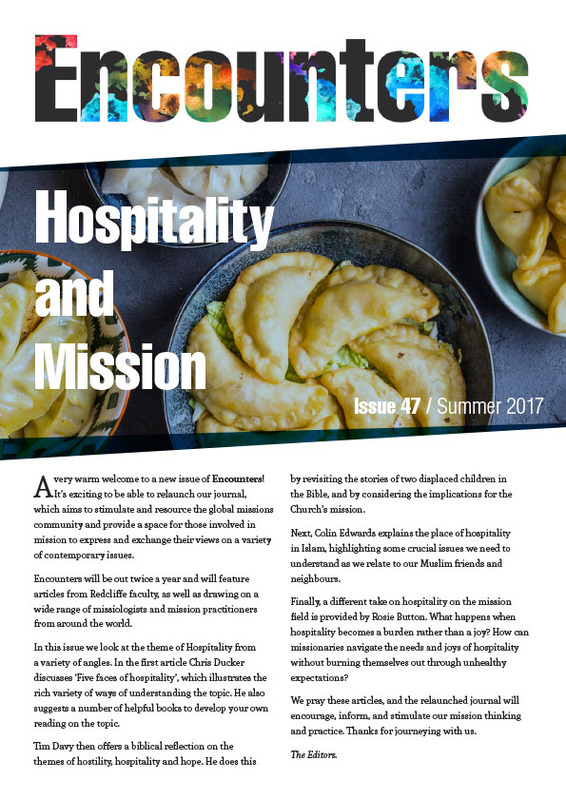 All of the papers you will find in this issue are written by students studying mission/missiology in UK colleges. We wanted to hear what students were wrestling with and what they were saying. I found the results encouraging. We see new things, we see traditional assumptions being challenged and we see familiar things approached in new ways. Some of the papers are longer ones so we have provided abstracts where this is the case, but I would ask you to pick one that piques your interest and engage with it generously. I have specifically tried to include students at different levels of study not just opting for the postgraduate level, believing that those that combine the reflection on and practice of mission are often those best placed to recognise wisdom. My paper shares some of my own reflections as I heard these new voices and may give you some places to start your engagement with them. Do bear in mind that most of these students are exposing themselves in print for the first time so if there is an absence in places of the smooth prose of experienced writers I hope too you will find the absence of some of the assumptions and blind spots that are often the downside of experience. Blind Spots, Bias and Encouragements – Engaging with new writers on familiar themes. Friend or Foe? An evangelical engaging Latin American Liberation Theology. Islamic Feminism as articulated by Fatima Mernissi and its Implications for Christian Mission. Pioneer Missions: With today’s emphasis on unreached peoples and frontier missions is there still any justification for missions outside such categories?